Although I love eating Dirty Fries, I strongly object to their name because there’s nothing particularly ‘dirty’ about them! They’re referred to as ‘dirty’ because they’re topped with traditionally ‘naughty’ foods, such as melted cheddar cheese, but the fact of the matter is, there’s nothing wrong with incorporating sensible portions of cheese within a healthy diet. There’s also absolutely nothing wrong with eating fries as such, as long as they’re not drenched in oil. In fact, potatoes are an excellent source of vitamins B6 and C, so they’re a brilliant addition to our diets. These Dirty Fries make an absolutely awesome evening meal and they’re seriously popular with kids and teenagers. I think they’re particularly good because every mouthful is a different flavour combination and they make a delicious vegetarian option for dinner if you leave out the sausage. Although I use fresh potatoes to make my own potato wedges (because I can trust that they are free from high FODMAP seasonings) feel free to use a bag of frozen chips if you like, but just make sure that they’re FODMAP-friendly and that they’re not coated in gluten or onion or garlic seasonings. 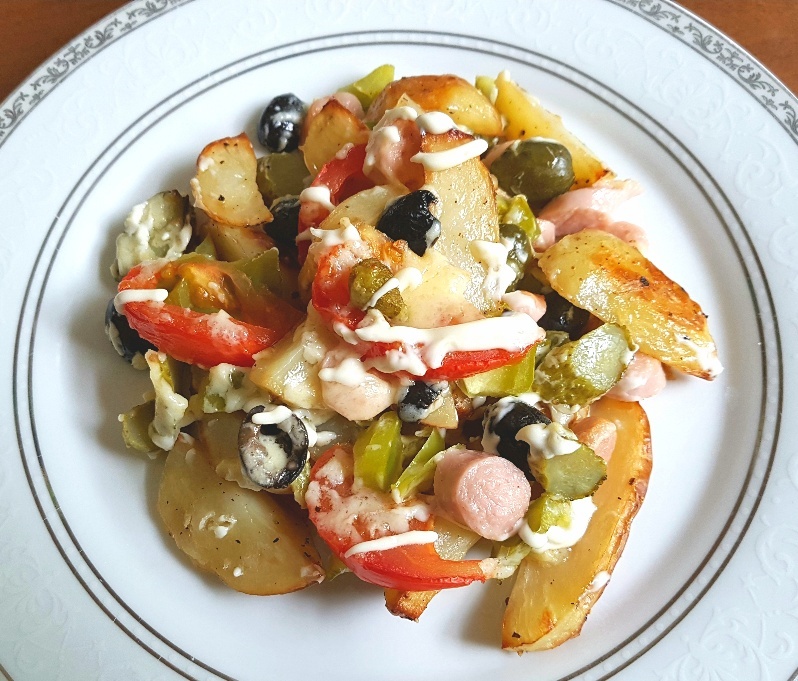 You can pretty much make these Dirty Fries however you personally like using low FODMAP toppings, but I like to top mine with grated cheddar cheese, little chunks of sausages, sliced gherkins and black olives. They’re also really good when made with a Mexican twist using slices of cooked chicken, thinly sliced red and green bell pepper and Mexican seasoning. (The Casa De Sante Mexican Seasoning is a really delicious certified low FODMAP Mexican seasoning blend and you can buy it here, if you like.) However you choose to top your Dirty Fries you certainly won’t feel dirty after eating them! Wash your potatoes (and peel them if preferred) before cutting them into equal wedges. 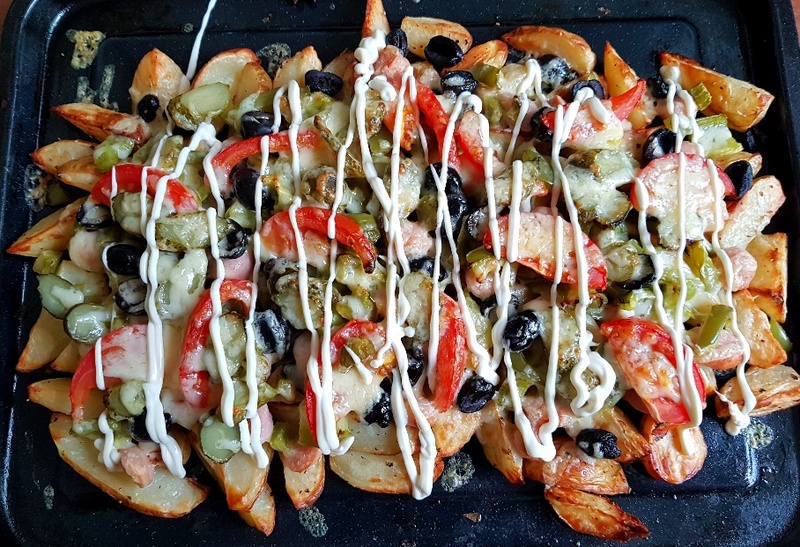 Bake the fries in the oven until they are just tender (around 30-40 mins) and then top the fries with all of the other ingredients before scattering the cheddar cheese on top. Cook the dirty fries in the oven until the sausage is cooked through and the cheese is melted and golden brown.